Virginia Union University will host the 2019 Commencement exercises on May 11, 2019 at 10:00am on Hovey Field. Commencement Rehearsal is at 1:30p.m. in Coburn Hall, Graduating seniors should bring degree hoods. You must participate in this rehearsal if you wish to participate in the Commencement Ceremony. If circumstances beyond your control require you to miss the rehearsal, you must contact Dr. Adelaja Odutola at (804)257.5697 or Dr. Ted Ritter at (804)257.5734 in advance of the rehearsal date for instructions. The Senior Breakfast and Rites of Passage ceremony will be on Friday, May 11, 2019 from 8-9:30a.m. in the Claude G. Perkins Living and Learning Center. All graduates interested in participating may contact Dr. Joy Goodrich at (804) 354.5213. The Senior Reception will be held prior to the Baccalaureate Service from 4-5:00p.m. in the Claude G. Perkins Living and Learning Center. Seniors, parents, alumni, faculty and staff are welcome. Commencement Exercises start promptly at 10a.m. at Hovey Stadium. Graduating Seniors will assemble at 9:00a.m. in Henderson Center, Room 1012. In case of inclement weather, an announcement will be made detailing an alternate location for the Commencement. A special area will be designated at Commencement for photography by relatives and friends of the graduates. If you do not wish to participate in the Commencement Exercises, your degree will be conferred in absentia. You must contact the Office of the Registrar (804) 257.5846 for instructions on how to receive you diploma. All graduating seniors who reside on campus must vacate their room assignment by 5:00p.m. on May 12, 2019. Check out times should be scheduled with the Residence Hall Director. If you have any questions, please contact Mrs. Regina Ziths in the Office of Academic Affairs at (804) 354-5213. 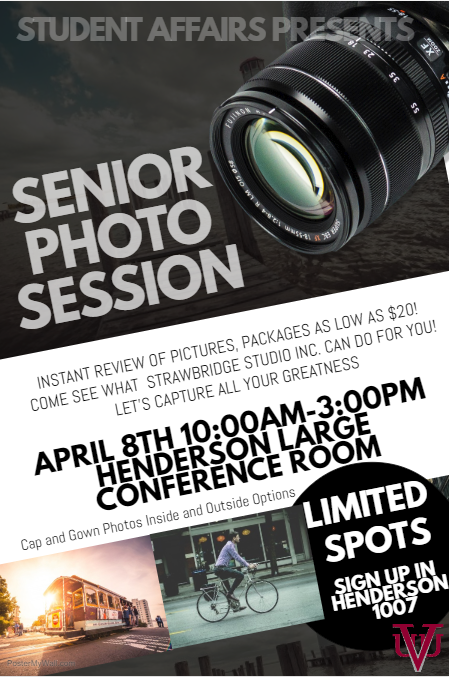 On Monday, April 8, Strawbridge Studio Inc. will be on campus to take senior head-shots from 10am - 3pm. Packages begin at $20, and payment is due at time of service with the option to view before paying. Sign up in Mrs. Lewis' office, #1007 in Henderson.